I suggested yesterday that the word “discrimination” is a misnomer. 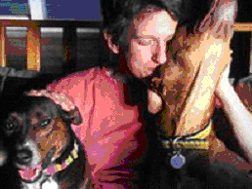 If you think about it sometimes the dog can be presented with multiple options that are basically the same option. The U-shaped pipe tunnel, for example, is a discrimination challenge that presents the same performance from the dog’s point of view. 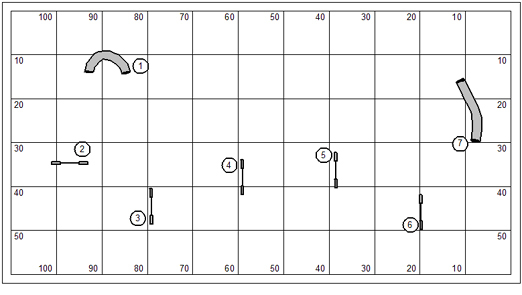 This sequence begins with an approach to the pipe tunnel in which the wrong-course and the correct entry are about 50/50 from the dog’s point of view. To tip the balance, what the handler does will have to be the deciding factor. Note that if the two jumps are taken more in a serpentine fashion rather than slicing straight through, the dog’s path begins to more surely favor the correct entry to the pipe tunnel. This is indicated by the red line in the drawing. 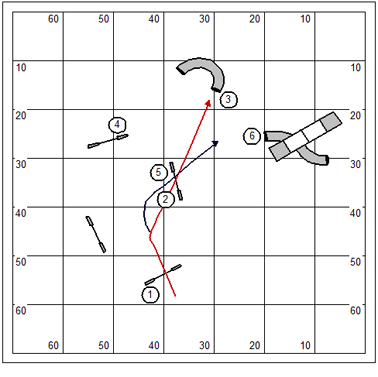 However… the blue line shows what happens if handler overdraws the dog into the turn. Then we find that a third tunnel option has been introduced to the dog. This is one of those subtle traps that might snag more dogs than the wrong side of the U-shaped tunnel. And many handlers won’t even see the trap when walking the course. Our sequence features yet another discrimination challenge. And while the challenge is overt and obvious, it is different from what we’ve discussed so far because the handler cannot avail himself to a lead-out to get to the “control position”. Nope, now everything is moving at the speed of the dog with no time for meticulously and carefully setting up. On course I’ve drawn a big red “X” the point on course that I believe to be the “control position”. The handler should arrive there by the time the dog gets up in the air over jump #5 in order to succeed with sublime dignity. Okay, it’s a cultural thing. More often my students are more laid back and kindly to their dogs. It’s a fact that they wouldn’t train with me if something in my message did not resonate. And yet, they operate inextricably out of the local culture. And in this culture, the dog is blamed for everything. Just to give this a little background, in this part of the world there has never been a system of handler training for dog agility. The responsibility for all things has been heaped upon the shoulders of the dog. So, as often as not, the dog really has to guess as to which direction and what to do next. In the game I teach the handler is 50% of the team and has real responsibility on course. The art of the handler comes from a carefully crafted and practiced communication with the dog that consists of verbal directive, movement, and training foundation. It’s clear to me that if you’re busy blaming the dog you’ve really overlooked the obvious. Your communication with the dog is an incoherent mumble. And, if you’re busy blaming the dog you can’t even learn from the mistake you just made. When my dog makes an “error” on course my conversation with myself will be based on an essential checklist: 1) Was my handling choice correct? 2) Was I clear in my directive & presentation? 3) Have I ever really taught him to do that? And trust me, if my dog makes an “error” on course the answer to one or more of these questions will be “no”. Let me leave you with this thought. You will not begin to learn your job and you can not improve… until you stop blaming your dog. What is the name of this statue? It sits atop what building? The word “discrimination” is probably a misnomer… but it is what we call the challenge in dog agility when there are two obstacles placed in close proximity. Somewhere early on we must have determined that we could teach a dog to discriminate between obstacles by the name or verb that we use to introduce the performance. 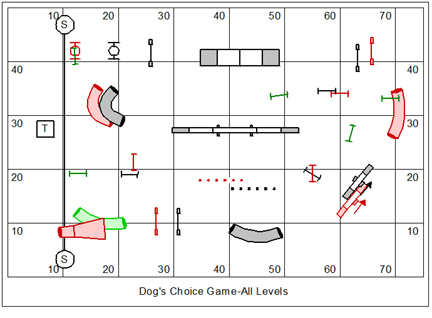 As it turns out, very few agility trainers actually teach their dogs the names of obstacles; and so the dog doesn’t “discriminate” at all, but relies on movement cues to understand the order and direction of the course. This is a typical opening course discrimination challenge. Note that the dog’s path clearly favors the pipe tunnel. I’ve gone so far as to draw the path trying to bring the A-frame into focus. But it just isn’t there. 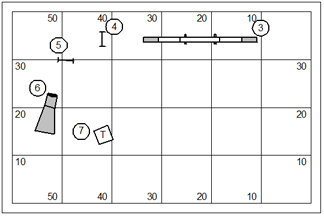 For the judge to put the discrimination at the beginning of a course, like this, is a kindly design feature because the handler can take a lead-out and be in a control position to direct the dog. There are two classic solutions to solving a discrimination challenge when the handler is forward of the dog. I’ll also show an interesting approach to solving the discrimination when the dog may be forward of the handler. As you look at these handling solutions try to decide for yourself which might be the best for you and your dog. As often as not the real question is where the course goes after the discrimination challenge. In this case, the course turns to the right. The blocking position on the discrimination means that the handler positions himself to block the dog’s approach to the wrong course obstacle. What this drawing really doesn’t show is what movement might accompany the block. I would prefer, if it were me, to begin with dog-on-left and use a simple Front Cross after the dog commits up and over jump #2. So the counter-rotation of the handler’s body gives a little extra power to turn the dog. The handler who leads out dog-on-right has predisposed the dog to think “pipe tunnel” all the way, and might find his knees taken out from under him as the dog plows his way to the tunnel. And, oh by the way, I’ll often have to remind my students who’ve used the blocking position… “When taking the blocking position the handler is obligated to do only one thing. What is that?” And the answer is… “Block!” The handler is not blocking if he’s left the wrong course obstacle wide open between his position and the correct obstacle. Indeed the handler is probably inviting the dog to take the wrong course. The other classic position when the handler is forward of the dog is the body magnet position. The presumption is that the handler is a powerful attraction to the dog and the dog will gravitate to the obstacle nearer to the handler. In general practice this is quite true, but often enough the handler discovers on course that he’s not nearly as attractive to the dog as he’d like to be. What the drawing doesn’t show is what movement the handler might use to give insurance to the magnet position. I prefer to use an RFP. I know some people like to call this a “False Turn”… but there is nothing false about it. 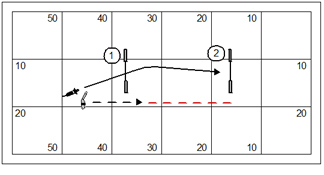 The RFP is a combination movement, Front Cross to Front Cross. 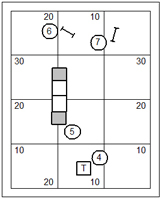 The handler commits to the first Front Cross as the dog comes over jump #2; and as the dog turns to attend the handler flips back with the second Front Cross which turns the dog neatly up onto the A-frame. I called this an insurance movement. You know… just like real insurance you might not have needed it at all. I’m big on insurance though and will take out the “policy” of the RFP just to be sure of the moment. You know if your barn is already burning down it’s too late to buy the policy. So far the discussion has focused on what the handler might do if forward of the dog. There might also be an elegant solution on the approach to the discrimination. In this drawing I have the handler doing a “Vee-set” approach. The handler sets the corner on the approach to the jump rather than the landing side. While this creates a slightly longer path for the dog it might be the best solution for certain kinds of dogs (know thy dog, eh?). Cool dude with a cool job: What’s this fellow’s name? And what is his job? I’ve been reviewing TDAA courses all day… hoping to stumble upon certain review notes that I make over and over again to different TDAA judges around the country. I’m happy to report that all of my reviews have been rather good today… but bad for my blog because I didn’t have any really messy stuff to play with. So, I will confine myself to a couple miscellaneous course design notes. 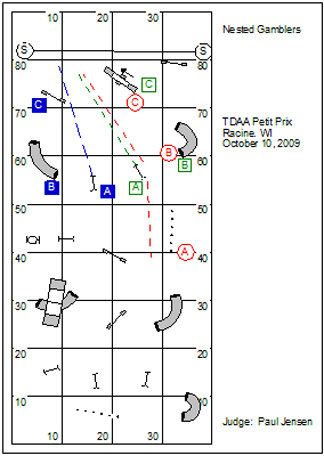 It is the nature of the TDAA that our judges often design for a small space. We have a certain number of obstacles that are required at each level; and we have some expectation for spacing between the obstacles and appropriate challenges. Pictured here is an extrapolation from a course submitted to me by a TDAA judge. What should jump out at anyone looking at it is the inadequacy of the spacing between the starting hurdle and the ending hurdle, not to mention the midcourse #9 to #10 transition. Our first impulse might be to tighten things up a bit; and maybe remove an obstacle or two. We can accomplish the same thing by using the minimum number of obstacles rather than the maximum. Right? 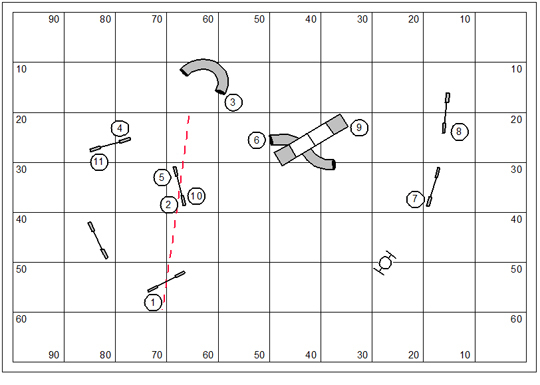 I’ve taken the liberty here to redesign the judge’s course and really without moving things around too much. While I did tweak some of the spacing, what makes the course fit into the available space was my willingness to repeat obstacles on the course. For every one I repeat… there’ll be one fewer getting in the way out there. 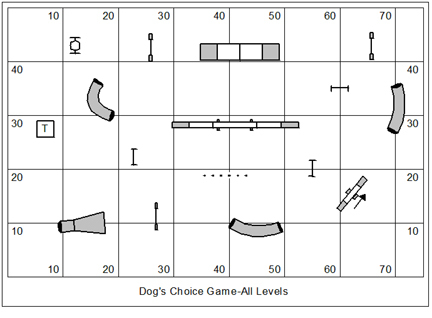 We play a lot of games that provide for a “dog’s choice” strategy… that means the obstacles can be taken in the order and direction of the handler’s choice, or the dog’s, depending on who’s in charge of the team. I want to share with you a couple of observations I make frequently with the judges designing these courses. 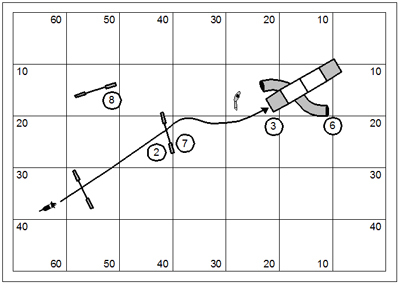 What strikes me right off the bat on this course is the long transitional distances between the obstacles. Course designers who are very precise in the interval spacing in standard courses might open up a dog’s choice game way too much. What we really need to remember is that the TDAA is designed for the very smallest dogs. 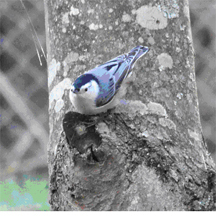 And for the little guys the long distances put them at a distinct disadvantage over long striding dogs. The riddle becomes how do we keep transitions between obstacles square and safe when we can’t anticipate which direction the dog will be coming from? One of the things I do when reviewing a course is plot a strategy for how I might run my own dogs. And if you’ll look at this course there just aren’t a lot of options for order and direction. I can see two or three different flow strategies. It would be fun if the design allowed ten or a dozen different flow strategies. This might be confusing to look at… so don’t agonize over it too much. Everything I moved or got rid of entirely is now red (which means it doesn’t exist there anymore). I’ve added obstacles to the course to provide for more options. These are in green. Note that I got rid of the collapsed tunnel altogether. Dog’s choice games shouldn’t really have a collapsed tunnel at all, especially if the rules allow them to take it multiple times. There should never be a collapsed tunnel in a game like Snooker, for example. Also, there are key jumps that I didn’t move so much, but rotated instead. Every jump in a dog’s choice game should be studied in terms of how square and fair it is from all of the surrounding obstacles. The rotation should strike a common denominator that favors as many approaches as possible. Okay… after I cleaned up the revisions course above, I still moved things around and tweaked a bit. I’m not sure I’m completely satisfied with it. But at the very least there are more options; and certainly the transitional distances between obstacles has been tightened up. This feels like a TDAA course. This is a multiple part question. 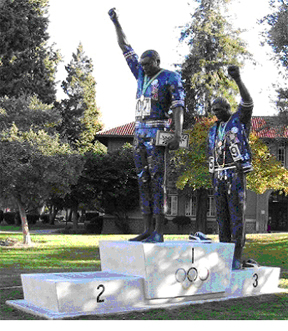 Who are the two men honored by this statue? Where is the statue located? What is the name of the man missing from the podium (the Silver medal winner)? I would love to go into the world to teach a series of novice to intermediate handling and dog training seminars. 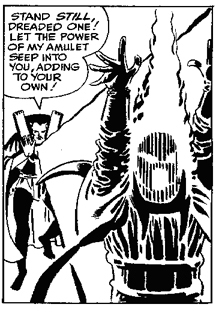 Almost always I wind up teaching the advanced to masters folks. The downside of this is that I’m still keen to teach a strong foundation for the handler. 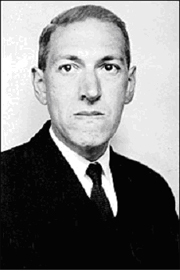 I believe that the handler should be active, energetic, and sublime. By the time they get “advanced” the typical handler is so warped by bad muscle memory that it’s far more difficult to set them aright. Their dogs have engaged in powerful compensatory learning which winds up being the sole redeeming quality of the team. I return to my opening premise: I would love to go into the world to teach a series of novice to intermediate handling and dog training seminars. It is poignantly ironic that novice handlers will stay away from seminar work in droves. I would be keener to build the best foundation in both the dog and the handler, rather than struggling to fix dog and handler after they’ve become entrenched in bad habits. 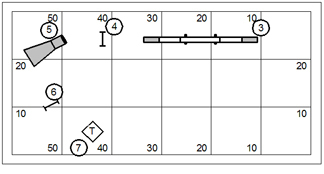 Many novice handlers are over-occupied with the notion that they need to square the dog up for the first jump in a sequence. In this drawing the handler leaves his dog, but releases while on the tangential path caused by simply trying to get around the wing of the jump. If the dog doesn’t follow the handler on the indirect path (not getting to the jump at all) he’s more than likely going to wrap quickly back to the handler on the landing side of the jump. This makes for a wobbly and awful start. What I try to teach my own students is to sight a nice straight line down the edge of the jumps. This is the handling path. It’s a straight line that allows the handler to move in a smooth line. The handler needn’t bother to begin the dog square to the jump at all. The dog’s path will straighten up after the jump. A secondary lesson, if there is such a thing, is to question why a handler would ask the dog to sit… and then not ask for a stay at all. It’s an all risk and no advantage scenario. I would be much better to learn to wind the dog up and go. Like many skills, one cannot own the skill if it is not earned by practice. Wind the dog up and go isn’t bound to always be a successful strategy unless the handler moves as fast as the dog. If the opening line is a long straight line the handler will discover one of the laws of a dog in motion: A dog forward of the handler tends to curl back to the handler’s position. Just to tantalize the dog I’ve added an inviting wrong-course obstacle off to the side the handler is working. Now all the rules have changed. Now we want the dog nice and square to the first jump so that the dog’s path down the line becomes suggestive and obvious. There is a test of adequacy to the lead-out. The handler must get far enough down the line to keep the pressure on the dog to continue movement without curling back to the handler and spoiling the line. The dog cannot be released during the handler’s initial movement to get around the wing of the jump. Instead the handler releases the dog after establishing the long straight line forward. I teach the lead-out as movement. There will be fewer incidences of dropped bars and running around the opening jumps when the handler is in motion, as compared to the handler who is standing still, facing the wrong direction, or both. If we really want to have a little fun with this sequence, consider learning and practicing a sling-shot start. The handler winds the dog around him on Post… and releases (the sling) from an aggressive lateral position. As the dog commits out to jump #1 the handler’s runs on a slight oblique or diagonal line to apply pressure back out to the dog’s path. 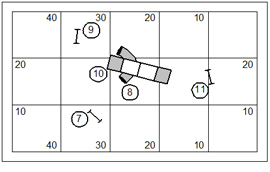 This is a lot of fun to play with and better than that rigid unforgiving mindset that assumes the dog should always be pressed into an obedience performance at the start of an agility sequence. Tonight we begin an interesting program… a free open training night (and potluck!) We’ll make a pot of coffee, have a table set for any potluck snacks, have agility equipment set, and sequence suggestions posted. Anyone can show up, whether or not they are students otherwise. We’ll start at 5:00 pm and shut off the lights at 9:00 pm. So it’s come when you like, sign up for some floor time (in 5-minute increments), set jumps for your dog, follow the sequences (or not), walk or train on the adjoining field, work on problem obstacles, visit with your friends, and leave when you like. There is no charge and this is open to all experienced handlers with experienced dogs or pups in training. Each time a Country Dream student brings a guest who hasn’t trained here before, our student’s name is entered in a monthly drawing for a free private lesson. We won’t allow beginner handlers with beginner dogs; though we’ll be more likely to trust experienced handlers with their beginner dogs so long as they keep it safe. 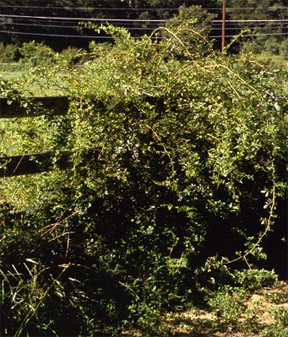 What is this prickly invasive hedgerow plant? 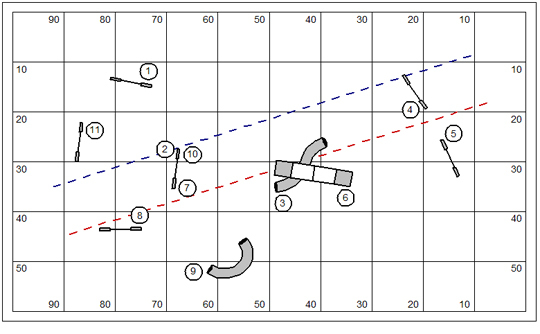 This is a numbered course judged using the “JFF” schedule of faults. Follow the numbers, keep the bars up, and hit all the yellow contact zones. Feel free to use whatever system of performance and faults that properly reflects the challenges for the venue in which you mostly compete. For the purpose of league play, obstacle faults will not resulting in elimination. Faults will be given a simple weighted value. Placement will be faults, then time. There is no standard course time. The local agility league has been my favorite form of competition for about a decade now. I know I should be more interested in being out in the world paying extravagant prices for titling opportunities in the various agility venues; but there’s nothing quite as fun as the weekly league competition. As an instructor the weekly competition gives me invaluable information about my students as competitors. I know it’s not a big serious competition or anything like that. But there’s something that happens to the competitor the moment that they know they are being scored and measured and timed. And this is the quality that I want to witness. I can’t really chase my students in three directions every weekend to see them in competition. The local league play competition will have to suffice. The design philosophy for league play games is to bring in challenges that I’ll see from time to time in competition. In class we can work on dog training issues, and handling skills. I’ve found that it’s a greater journey recognizing the application for those skills in competition. From an agility trainer’s point of view, it’s important for me to present my students with real-world challenges and to test the efficacy of my teaching. What was the name of the HBO special that featured the person in this photo? Who is this person? I’ve found over the years that even deceptively simple sequences will test the analytical abilities of the handler. The handler’s analysis is key to success in this sport. What is the right movement? On what side should I work the dog? Getting the right answers to these questions is fundamental to success. Good handling on a foundation of bad training is more likely to succeed than bad handling on a foundation of good training. In the ideal world… we’ll have both good training and good handling. The point of course… we should endeavor to train the handler with the same high criterion as we apply to training the dog. We were treated to this fun roller-coaster of a ride at a recent NADAC trial. You’ll note that the key feature of the sequence is a concave curve of jumps. Otherwise it would simply be a loop, and not nearly as fun. The sequence turned out to be a tough intellectual puzzle for too many players. You’ll note here a common attack on the sequence: the handler running to bend the dog back into the curve; I suppose in order to be on the turning side of the course on the approach to the pipe tunnel. 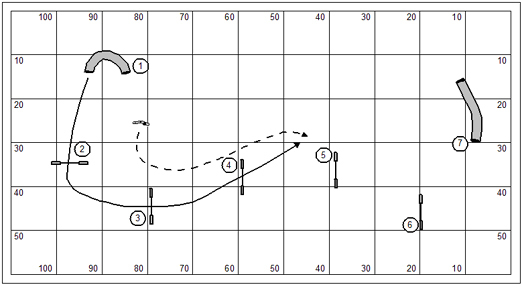 The real problem with this approach is that the handler wasn’t really on the turning side of the course when he needed to be… and the consequence is that the dog continues the curl back towards the handler’s position after jump #4 while the course actually goes another direction. This led to collisions and wobbly fumbling in the handling moment. We’re always faced with the riddle of sides in agility. The handler should rely on a very basic law of the dog’s movement: the dog turns most naturally in the direction of the handler. And by understanding this, the clever handler will endeavor to position himself on the side of every turn. 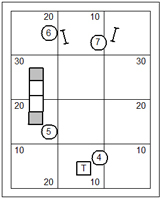 In the strategy shown in this drawing the handler seeks a Cross forward of the dog between jumps #3 and #4. 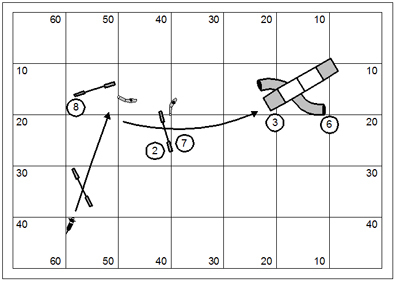 Now the handler’s position after jump #4 draws the dog towards jump #5… rather than away from it. Okay, the strategy actually puts the handler on the side away from the turn in the transition from jump #6 to the pipe tunnel at #7. If we really think this though there is considerably less risk associated with being on the wrong side of the turn here… than there was in that transition between jumps #4 and #5. Let’s go back to the original handling position, in which the handler keeps the dog on right through jump #4. Frankly the sequence can be solved from this side, but will require a bit of handling skill and something slightly cleverer than stepping in front of the dog. 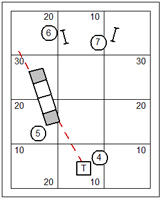 The handler might use a Tandem turn, stepping behind the dog on the landing side of jump #4. When reviewing courses for the TDAA I will routinely make comments about the approaches to obstacles. In the Beginner class the approach is always square to everything. In the Intermediate and Superior classes we insist only that the approach to contact obstacles and to the tire are square. Be very clear that this is the course designer’s responsibility. After designing the course it’s a simple matter to trace back through to visualize the path of a dog working at a reasonable, brisk, and agile pace. In this drawing I provide the lines showing a reasonably optimistic representation of the dog’s turning radius. Note that there is no way the dog has a square approach to the dogwalk… the approach is nearly perpendicular. The good news is that the approach is fairly easy to fix simply by rotating and repositioning the jump labeled #2 in the drawing. I gave plenty of room after the jump to adjust the dog’s turning radius to get the square approach. 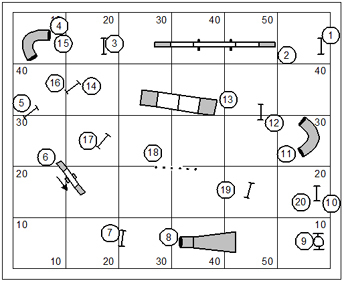 In this drawing the top of the course-map truly represented the top of the ring. 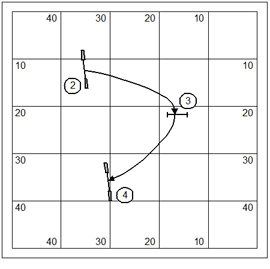 That is an example of what I call “running the dog into the wall.” My recommendation would be not only to adjust and move the jump, but to move the A-frame to the left to change the line of approach (which is the only way to change the line of dismount unless the handler takes responsibility for shaping the approach). The problem with moving the A-frame… is that now I don’t have a pretty square to the A-frame. Frankly this isn’t as unsafe as some things I’ve seen in agility. 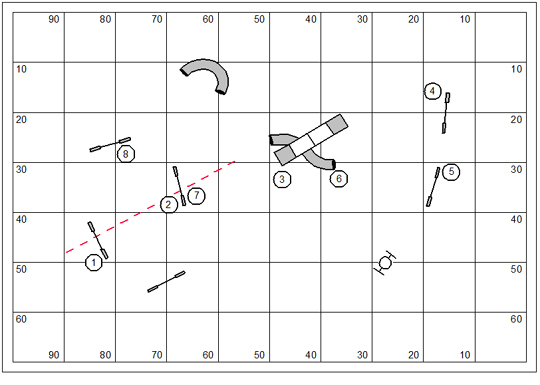 But since the square approach is the judge/course designer’s job… let’s do it here as well. All we really had to do after moving the A-frame is give it some rotation back to the table to anticipate the dog’s approach. I’ve drawn a red path-line off the center of the table and through the A-frame. That line should pass through the A-frame without either entering or exiting on the sides before I’ll actually consider it square. In this sequence the handler is challenged with a wrap from the pipe tunnel up onto the A-frame. 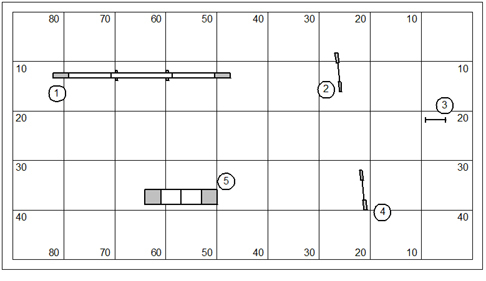 Did you know there are two popular agility venues in which this course design is not allowed? It’s true. The real problem with it is that some handlers just don’t know how to make this square and safe for their dogs. We actually allow the wrap in the TDAA because the slope of our A-frame is less arduous than in any agility venue. 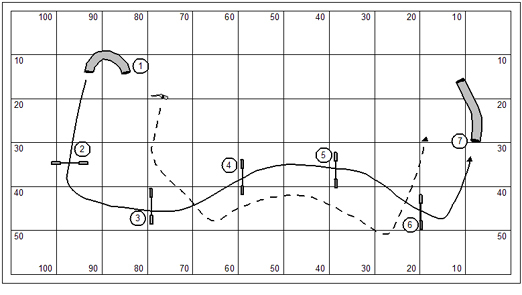 But in my own course design I would use such a challenge only once in a blue moon. The problem in this sequence is that the judge has crowded the table into that bit of real estate the handler needs to create the square and safe approach to the A-frame. This nearly ensures that the handler will shorten up the approach and probably force the approach at an unsafe angle. Here’s another sequence that comes from a Beginner course. Remember what I said above? 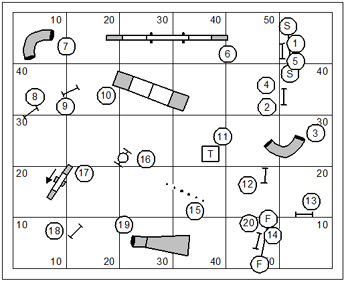 In the Beginner class the course designer should endeavor to square up all obstacles. Angled approaches are quite advanced to the truly beginner dog. Our objective in Beginner is to test whether the dog has been trained to do the equipment without any fancy tests of advanced handling and training. Note too that the approach to the collapsed tunnel is at something of an angle. In general I don’t fret too much about angled or even shaped approaches to the collapsed tunnel so long as there is plenty of room for the handler to shape the approach. An angled approach to the collapsed tunnel invites a “hip pointer” injury. Have you ever seen a hip pointer? The dog will scream in pain. And so, we should endeavor to avoid the angled approach… and just make it straight, especially for the Beginner class. The fix in this case was quite simple. 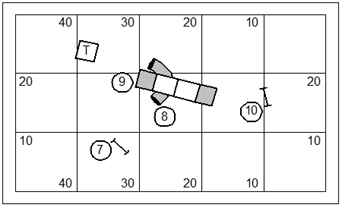 Jump #11 was rotated to square up to the dog’s approach; and the collapsed tunnel and jump #13 moved south about 5’ so that the dog’s turning radius brings the dog to square. In this drawing the left side of the course was the true ring boundary. I always treat the ring boundary as though it were a brick wall. Often when you’re designing courses for some club out there you truly do not know what that boundary is. It might be a slender plastic tape running from standard to standard. It might be one of those accordion doggie gate things. And it might be a brick wall. In this case we got the square to the collapsed tunnel… but the dismount right into the brick wall is undesirable. The easy thing to do is swap the collapsed tunnel with jump #6; though when I did the swap in this drawing I was careful not to jump the dog into the brick wall either. Now we can make the approach to the collapsed tunnel nice and square for the dog. Who are the two characters in this drawing? Who was the artist? This wasn’t actually the beginning of the course; but it was the part of the course that was responsible for an extraordinarily high NQ rate. Truly only the top of this drawing and the right side represented the true ring boundaries. And so what we really need to see here is that for the most part dogs had a wingless jump with low visual acuity against the ring boundary (where there’s going to be a lot of visual clutter anyhow). If we combine this problem with the idea that too many handlers don’t understand a dog’s movement at all… in a pinwheel, then it’s a recipe for crash ‘n burn. The lazy and artificial line drawn by the Clean Run Course Designer (CRCD) is commensurate with the lazy thinking of the handler who doesn’t understand the true shape of the dog’s path in a pinwheel. If you think in round terms… you are so doomed. 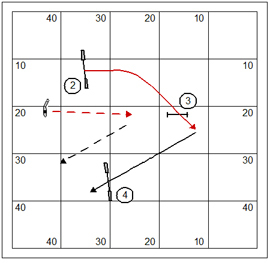 Think about it this way… the “corner” is the timing event for the handler to communicate a change of direction to the dog. Where exactly is the corner in a “U”? Indeed because the handler is engaged in round and sleepy dreamy movement, then they won’t be supporting the dog out to the end jump in the pinwheel. By the way, note that if the curve continues over the bar of the jump… that means the dog is changing directions in the air. And while I’m not really a physics major… I’ll submit that is impossible. Supporting the dog is really a simple matter of keeping focus and pressure to the jump on the outside of the pinwheel. I know this drawing shows the handler stepping deep into the pocket. 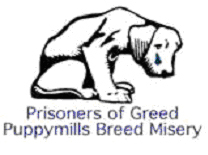 For most dogs the handler’s movement this deep into the pinwheel really wouldn’t be required. 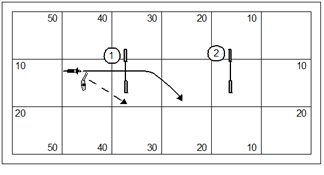 But the pressure of facing and moving towards the outside jump in the pinwheel is the pass or fail handler test. If the handler rotates away to jump #4 (and beyond) before the dog has actually committed to jump #3… why on earth should the dog actually do it? There is a city that partly exists in one continent and partly on another. What is this city? 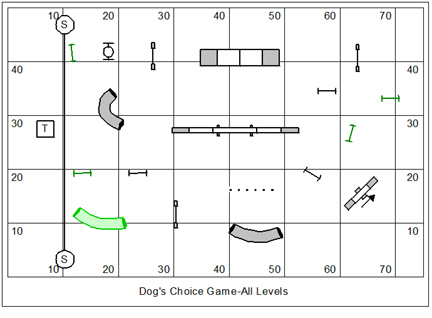 The purpose of this game is to direct your dog over a simple short course and attempt a distance challenge. This course features separate containment lines for Novice dogs and for Advanced/Masters. If the handler sends the dog to work (obstacles #5 through #8 on this course) while staying behind the red containment line, a 10 point bonus is earned. If the handler sends the dog to work (obstacles #4 through #10 on this course) while staying behind the blue containment line, a 20 point bonus is earned. 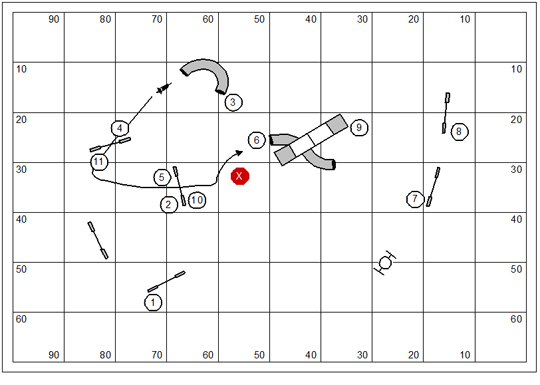 For the purposes of league play this game will be scored time+faults-bonus. It’s important to recognize that in NADAC Chances is not a “giveaway” class. In order to succeed the handler must communicate changes of direction and solve discrimination problems while the dog is working at an impressive distance and typically in flowing generous lines that promote a dog working at full speed. In NADAC this is a pass/fail class and is not placed. If the judge calls any fault the scribe will mark the score “faulted”; if the dog runs without a fault the scribe will mark the score “no faults”. The dog’s time is handled in a similar fashion. If the dog’s time is equal to our less than 40 seconds the scribe will write a time of “40” on the scribe sheet. If time goes over 40 seconds the scribe writes a time of 41 on the scribe sheet. Note too that the handler’s containment lines are more thoughtfully drawn for the NADAC Chances class. The NADAC line might suggest reasonable movement for the handler to enhance the dog’s chances for success in the class. As I have the line drawn above… the line is more of a riddle for the handler. The performance of the distance challenge is not like the traditional gamblers class in venues like the USDAA and TDAA. The most important difference is that the containment line will apply to the dog as well as the handler. While the dog is permitted to cross the line in a reasonable working flow, the handler may not draw the dog across the line to shape a send back into the distance challenge. What constitutes “outside the box” thinking in a traditional gamblers class will earn a fault in NADAC. There is a town in Arizona that had a name of only one character. But at the time of incorporation the state had a rule that a town must have a name of at least three characters in length. What was the name of the town then? What is the name of the town now? 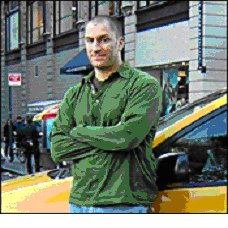 You are currently browsing the Bud Houston's Blog blog archives for February, 2010.